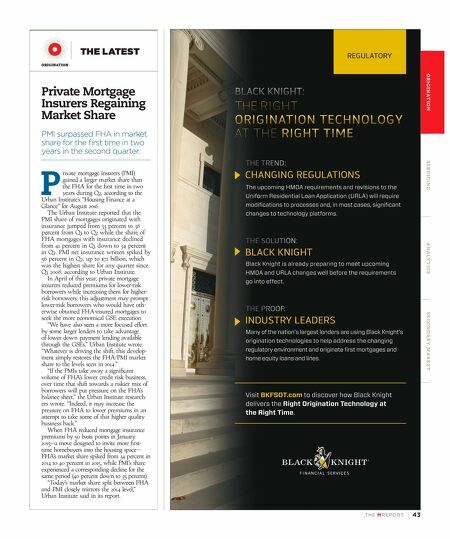 TH E M R EP O RT | 43 O R I G I NAT I O N S E R V I C I N G A NA LY T I C S S E C O N DA R Y M A R K E T ORIGINATION THE LATEST Private Mortgage Insurers Regaining Market Share PMI surpassed FHA in market share for the first time in two years in the second quarter. P rivate mortgage insurers (PMI) gained a larger market share than the FHA for the first time in two years during Q2, according to the Urban Institute's "Housing Finance at a Glance" for August 2016. The Urban Institute reported that the PMI share of mortgages originated with insurance jumped from 33 percent to 38 percent from Q1 to Q2 while the share of FHA mortgages with insurance declined from 41 percent in Q1 down to 34 percent in Q2. PMI net insurance written spiked by 56 percent in Q2, up to $72 billion, which was the highest share for any quarter since Q1 2008, according to Urban Institute. In April of this year, private mortgage insurers reduced premiums for lower-risk borrowers while increasing them for higher- risk borrowers; this adjustment may prompt lower-risk borrowers who would have oth - erwise obtained FHA-insured mortgages to seek the more economical GSE execution. 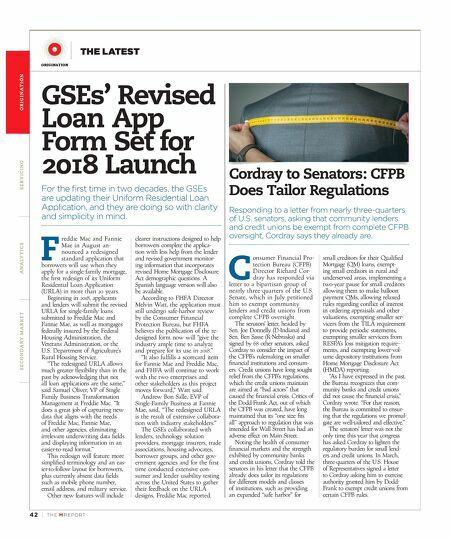 "We have also seen a more focused effort by some larger lenders to take advantage of lower down payment lending available through the GSEs," Urban Institute wrote. "Whatever is driving the shift, this develop - ment simply restores the FHA/PMI market share to the levels seen in 2014." "If the PMIs take away a significant volume of FHA's lower credit risk business, over time that shift towards a riskier mix of borrowers will put pressure on the FHA's balance sheet," the Urban Institute research - ers wrote. "Indeed, it may increase the pressure on FHA to lower premiums in an attempt to take some of that higher quality business back." When FHA reduced mortgage insurance premiums by 50 basis points in January 2015—a move designed to invite more first- time homebuyers into the housing space— FHA's market share spiked from 34 percent in 2014 to 40 percent in 2015, while PMI's share experienced a corresponding decline for the same period (40 percent down to 35 percent). "Today's market share split between FHA and PMI closely mirrors the 2014 level," Urban Institute said in its report.